Local go-to gal for all things web-o-matic. Looking for a way to keep your site safe, secure, and up to date? A Care Plan ensures your peace of mind. Apart from content updates, your WordPress installation needs ongoing attention to maintenance to perform optimally. Regular backups, security scans, and uptime monitoring all contribute to a more robust site, and a better visitor experience. A Care Plan frees you from worry about updating your WordPress installation, and will give you a resource for questions and/or update tasks. Conventional wisdom says an About page should be about you. That’s wrong. Your About page isn’t really about you, it’s about your potential customer. It’s time to ditch that “just OK” About page and pivot to a strategy that helps you sell, sell, sell! The Much Ado About You!™ process creates a compelling story focused on meeting these objectives. It’s all centered around how you provide value, and the incredible benefits customers reap when choosing to work with you. Dig into Much Ado About You! 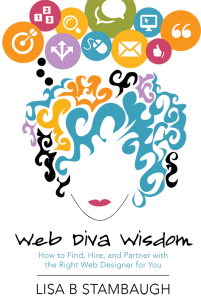 My book Web Diva® Wisdom: How to Find, Hire and Partner With the Right Web Designer for You, shares the tips and tricks enabling you to choose the right web pro for you, and collaborate to develop the best website for your products and services. I write articles for The GoDaddy Blog, GoDaddy’s online magazine and discussion forum focused on website development. What’s the current count of websites designed and built?